Published: Feb. 26, 2016 at 10:37 a.m. Updated: Feb. 29, 2016 at 12:16 p.m. Selecting an offensive tackle in the first or second round is generally a safer pick than other positions. While it is true that some highly rated quarterback protectors haven't met expectations in recent years, they still typically become at least average starters for six or seven years, moving from left to right tackle or kicking inside to guard, if necessary. 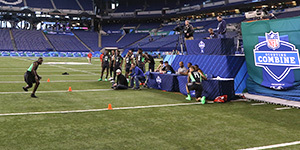 As long as a player has enough length, strength, durability, and athleticism to stay on the field, the team can prioritize other positions in future drafts. These three tackles are my safe bets in the 2016 draft class. As with every position group in this series, there is a mix of top-rated prospects and others for whom I project a long NFL career without the early-round hype. 1. Laremy Tunsil, Ole Miss: Athleticism, strength, length, tenacity. Tunsil possesses those traits, as do most trusted starters on the blind side. His suspension last season should not worry NFL decision makers, especially after they review his game film from the past couple of seasons. 2. Jack Conklin, Michigan State: Conklin's not the most athletic of left tackles in recent drafts, but he doesn't lose battles against quick pass rushers. He will lay into his man on every play, owning the edge in the run game. Bull-rushers simply hit a wall when trying to go through him into the backfield. Put him down for a decade as a starter at left or right tackle. 3. Taylor Decker, Ohio State: Conklin and Decker could easily be 2a and 2b on this list, as both have the physical characteristics and nasty attitude to battle elite NFL defensive ends. Decker overcomes his 6-foot-7 frame with good natural bend and foot quickness. He doesn't take plays off, and is willing to block two or three defenders before the whistle blows. I expect him to have at least a solid Jeff Backus-type career. â Follow Chad Reuter on Twitter @chad_reuter.